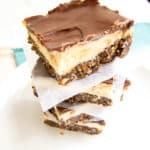 These nutty, chocolate-y, buttery bars are rich, delicious, and super easy to make. No baking required! Melt butter in a large saucepan, then add cocoa powder and sugar. Stir until sugar is dissolved. Add one beaten egg. Stir well to cook egg while the mixture is hot. Take off heat and stir in shredded coconut, chopped almonds, and graham cracker crumbs. Stir well until combined. Press into an ungreased 8x8 pan. (I like to line my pan with parchment paper to make it easy to lift out of the pan.) Chill the bottom layer in the fridge while you make the filling. Doing so will make it easier to spread the filling on the bottom layer. In a medium bowl, cream softened butter, powdered sugar, heavy cream, and vanilla pudding mix (or custard powder). Beat until light and fluffy. Spread custard mixture over the bottom layer. Chill in the fridge while you prepare the layer. Melt chocolate and butter on the stove or in the microwave. Let chocolate mixture cool slightly, then spread over the chilled custard filling. The chocolate is easiest to spread when the cream layer is well chilled. Once you have all three layers, cover and chill in the fridge until solid. Cut into 9 slices and enjoy!